All dog training clients deserve an understanding of what they can expect during training sessions! 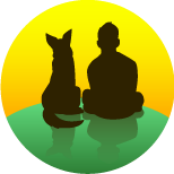 By My Side Dog Training uses humane, force-free, positive reinforcement methods based on current, science-based dog training and behavior knowledge. It’s important to understand what the human experience will entail, too. Expect that your dog training sessions (either in a class or a private setting) will help you to earn the privilege of calling yourself A Dog’s Companion. Advancement of your dog training and behavior knowledge by hearing an explanation of the approach for a particular skill or behavior. Demonstrations with your dog or observing a demonstration on video to enhance learning. Trainer demonstrations are possible in most situations. Coaching as you apply your new knowledge and skills providing you the opportunity to practice in the presence of the trainer so that important learning points can be emphasized. Everyone’s journey with his or her dog is different. Dogs learn at different paces, and consistent and persistent application of the techniques that you learn are important for your dog’s learning. Building the bond with your dog in a fun and cooperative manner will provide for a happy and healthy relationship!